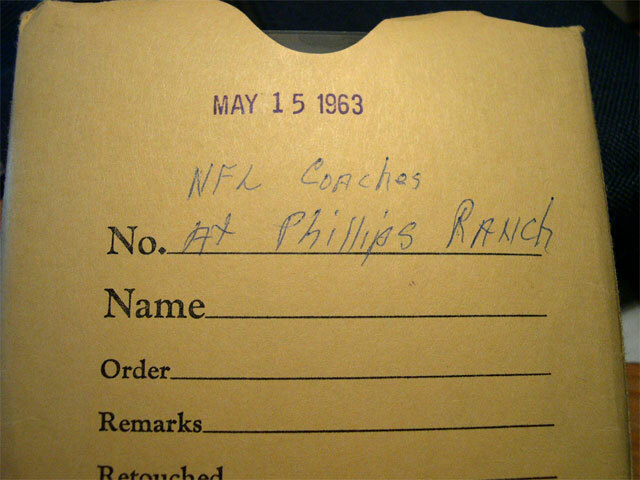 Apparently there was a meeting of the NFL coaches on or about May 15, 1963, at a ranch near Dallas. That's all I know so far. 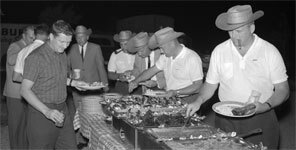 I'm not a football fan, and certainly wasn't in 1964, so I don't really know who I'm lookin' at, with the exception of Tom Landry. 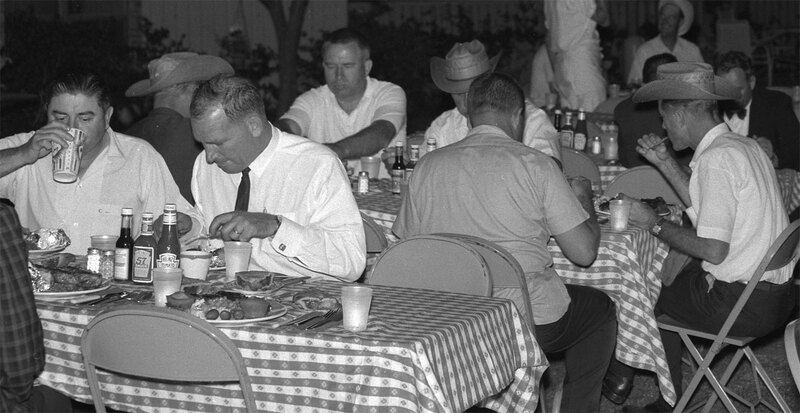 Others in attendance at this meeting, according to various people who have seen these pictures, include men named Ditka, Halas, Lombardi, Ewbank, and Shula. The photos on this page represent about one third of the pictures in the envelope. The negatives were found in this envelope. 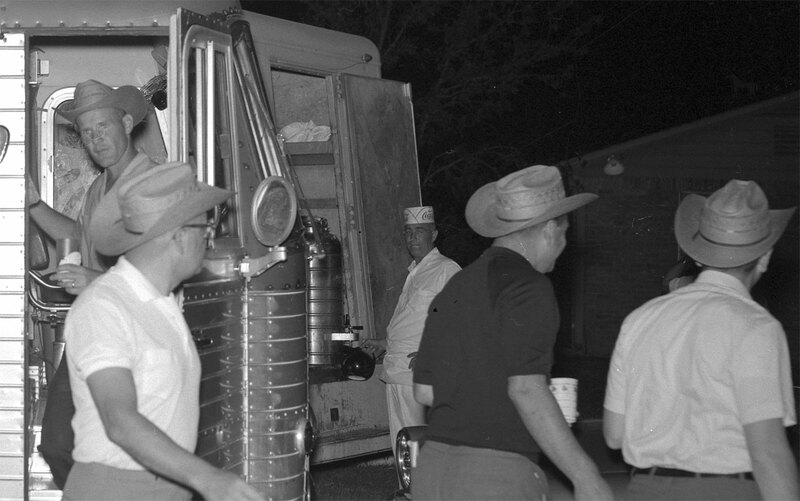 The coaches arrived at the ranch on a bus. The only person I recognized was Tom Landry. There is a little piece of lint on this picture, but I should be able to take that off with Photoshop. Hmmm... is that Weeb Ewbank on the left? After dinner they stood around and watched something happen. 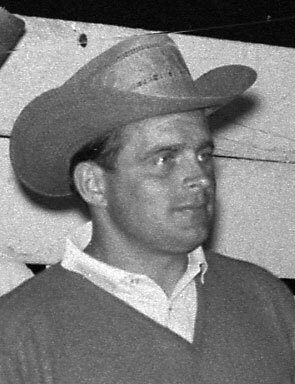 No, it's Harland Svare, coach of the Rams. Many thanks to John Richards for making the identification. 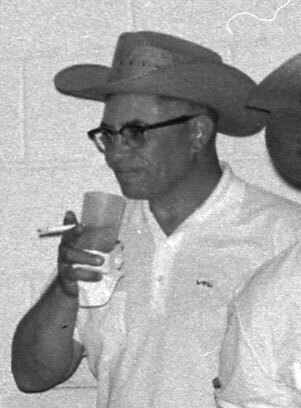 New York radio personality Mike McCann sent in this information: "The short fellow in the white shirt with two cigars in his shirt pocket is Allie Sherman, who led the New York Giants to NFL Eastern Conference titles three straight seasons — 1961 to '63." They're all having great fun. 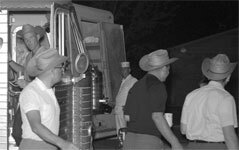 These men were famous 50 years ago, so there should be plenty of people who recognize them today. My father, B.F. Phillips, Jr., hosted the coaches outing to the Phillips Ranch in Frisco, Texas. I was a bit young myself at the time so do not recognize many faces. I do remember meeting Coaches Landry, Lombardi and Norm Van Brocklin. There is a picture at the bottom of the page titled "They're all having great fun." In that photo, on the far left, is Mr. B. A. 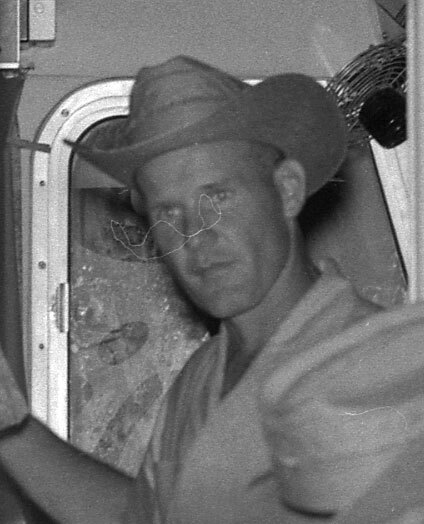 "Hop" Hopkins (with the bullhorn), a long time employee and right hand man to my father. 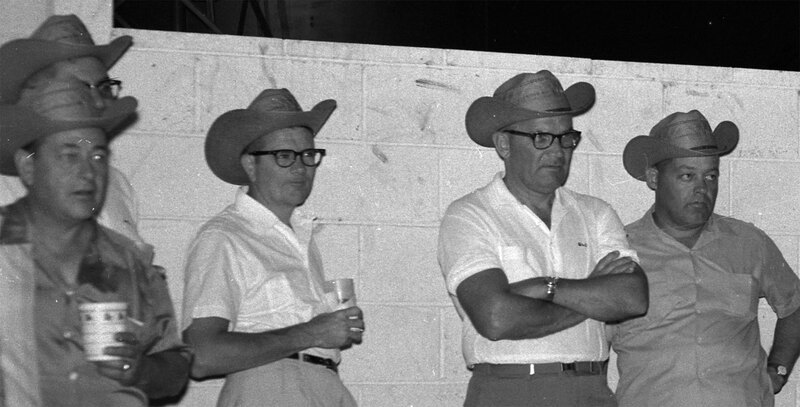 Mr. Hopkins was, as I remember it, providing commentary as the coaches were watching a demonstration of a quarter horse cutting contest in our covered arena. The steak dinner was catered by Coburn's of Fort Worth. 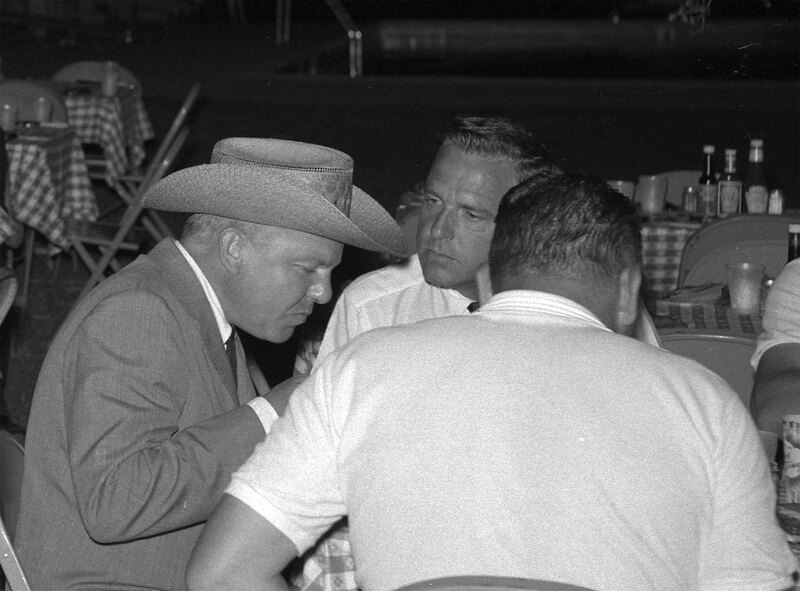 In another photo, "After dinner they stood around and watched something happen", I think the man standing alone in the middle of the photo, cup in hand and in dark framed glasses is probably Dallas Cowboys owner Clint Murchison, as his team hosted the coaches meeting. Thanks, Michael. That clears up a lot of loose ends about these photos. This week I received an email from Larry Hopkins, whose father, B.A. Hopkins, was the man with the bullhorn in the last picture above. 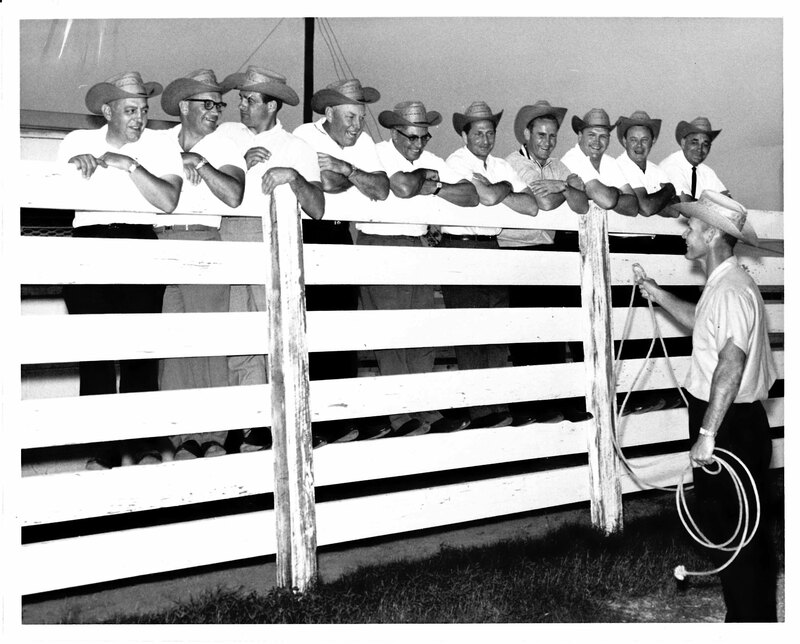 Larry says, "I am enclosing a scan of one of the photos that has the coaches all together standing on a fence. My dad hand wrote a list of them and follows from left to right." 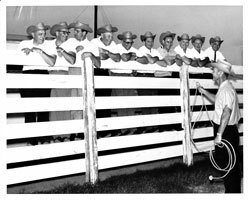 Tom Landry is holding the rope in front. Photo courtesy Larry Hopkins, used with permission. All rights reserved, except as stated above.